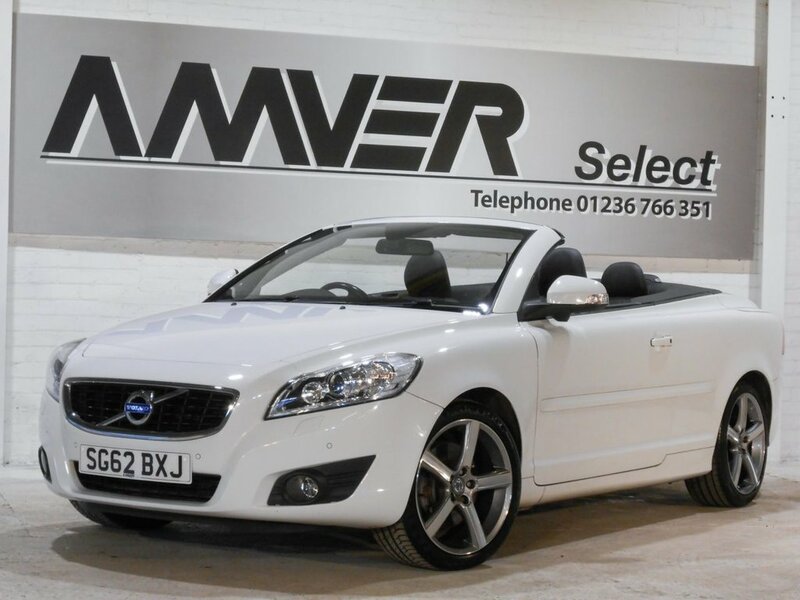 A low mileage high specification Volvo C70 SE Lux Solstice edition in Ice White with black full leather trim, aluminum accents and Volvo 18" Midir diamond cut alloy wheels. Powered by the excellent D3 diesel engine and very well equipped with heated electric seats, satellite navigation, premium sound system with Dolby Pro Logic II, blind spot monitors to alert you to other vehicles in your blind spot, front & rear parking sensors, power-folding electric mirrors, rain sensor wipers, bi-Xenon headlights & keyless entry & ignition system so that you will never need to take the keys out of your pocket or bag. The beautifully designed fully automatic electric folding convertible hard top gives all the security, style & solidity of a fixed-roof coupe and all the top-down fun of a cabriolet when the weather is favourable. Just 39,000 miles, supplied with complete book pack in Volvo wallet & two keys, last serviced at Volvomax Glasgow just twenty miles ago. This car comes with six months Momentum Platinum Plus warranty so that you can drive away with total confidence knowing that you are benefiting from what is probably the best warranty cover available in the UK today. We have signed AA's Dealer Promise which means all cars are provided with a full history check & 12 months AA breakdown cover or member upgrade.